CAD is losing its strength as the result of the US ADP employment survey and Canadian GDP for Q2. 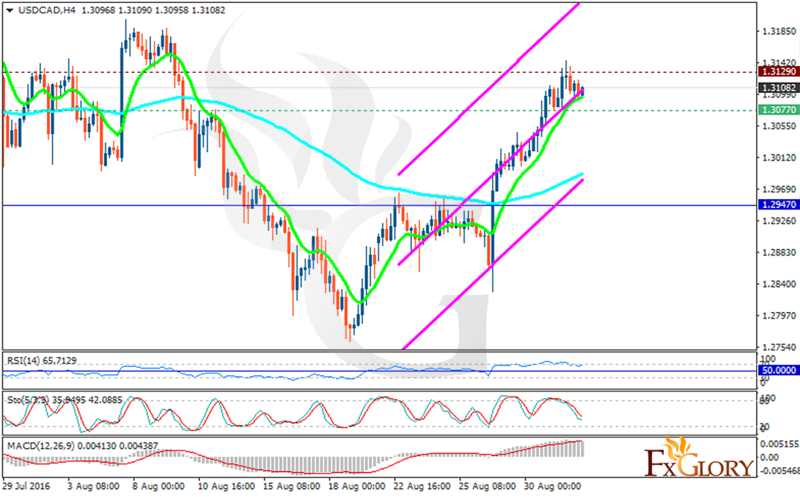 The pair is finding support at 1.30770 with resistance at 1.31290 which both lines are above the weekly pivot point at 1.29470. The EMA of 10 is moving with bullish bias along the ascendant channel and it is located above the EMA of 100. The RSI is moving on over bought area and the MACD indicator is in positive territory however the Stochastic is indicating price fall. It is hard to predict the pair’s direction however the resistance level breakout will motivate buyers to target 1.3150 but the support level breakthrough will cheer the sellers up by targeting 1.3050.